My question is if someone made a polymer framed new P7 clone, would people buy it. Lets say at a price point of $600. The problem is that it would probably be double the price. I had a nice collection of P7M8's and P7M13's all with DelFatti leather but just recently sold them all. They really are amazing firearms but I lost interest in shooting them and I'm not a collector. I do wish I would have held onto at least one P7M8. There are only 3 things I NEED from ze Germans, a 433.. an optics ready slide for the VP9, & a reissue of the P7...any of those come to fruition on the American market, I will make a credit card weep!! Amen to that brother!!! Add to that ANY of the 9X series of rifles and it will rain US green backs in Germany with a rainbow starting from Columbus, Georgia...! The PSP inherently has such a small slide in terms of height and width and overall length for barrel length, an integral suppressor would be wicked cool. It is going to be a niche and expensive gun anyway. How much do these bad boys go for in the market? Interesting pistol don’t know much about them. If one must ask the price... Just make sure you're sitting down. Last one I saw in my LGS had a threaded barrel and the asking price was $2000.00 plus/minus. I suppose if you can afford a custom 1911 you can afford a P7M8. I bought my P7M8 in 1996 for $600.00. I was recently offered $2000.00 for it. I have the box, Manual and carbon scraper. I think I’m going to hold on to it for a while. I haven’t shot it in several years but it is still a really neat pistol. I finally found a great one at a LGS last year P7PSP. Every time I bring it to the range, someone asks "What's That?" As soon as I get "HK" out they say I've always wanted one of those. 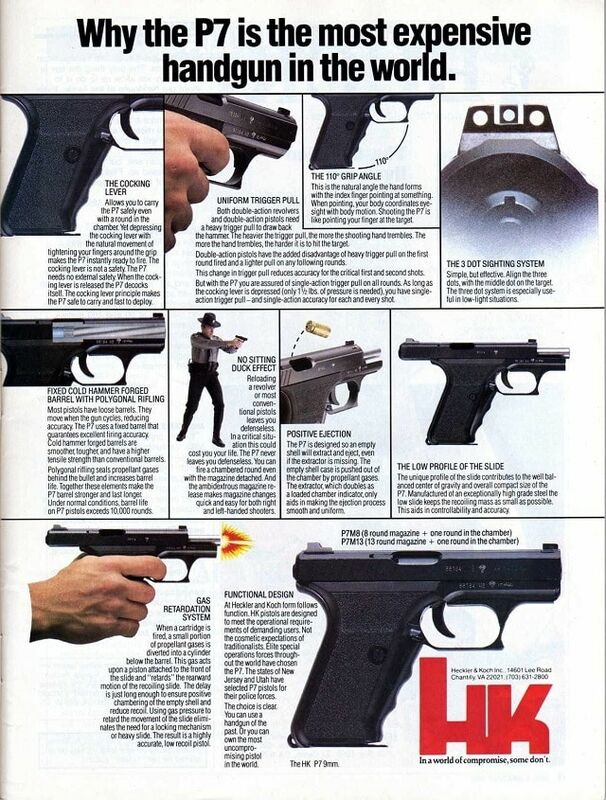 Walther uses a similar action in the CCP for about $300, but of course it's not the same.